“dinner irl”: a new series! And as this dinner was cooking away – completely unattended, which allowed me to sit with a drink – I thought, “I should really post this recipe. It’s SO good”. But then I thought, “Nah, it’s nothing special. Nothing ‘post-worthy’. Nothing my readers would want to see”. But THEN I thought, “Wait. This might be EXACTLY what my readers want to see”. Because I know you’ve given a lot of love to my birthday layer cake, homemade sprinkles and DIY s’mores, but I imagine you’d appreciate something that you could use, say, on a Tuesday night. And lo, a series was born. And I’d LOVE your participation on this one. Every few weeks I will post an actual dinner that I make on the regular for my family – a dinner that can be easily whipped up even on the busiest weeknight, and satisfy even your pickiest eater. I’ve made a Pinterest board so that you can easily find all the recipes – past, present and future. And I’d love to see your “real life dinners” too! Use the hashtag “dinnerIRL” on Instagram, and tag me so that I can see! I’d also love to know what your weeknights look like – both your dinner challenges as well as your go-to meals. I adore this dish, and so does my family. It basically cooks itself and yet doesn’t look or taste like a slapped-together meal. Prepare the chicken: Pre-heat oven to 475. 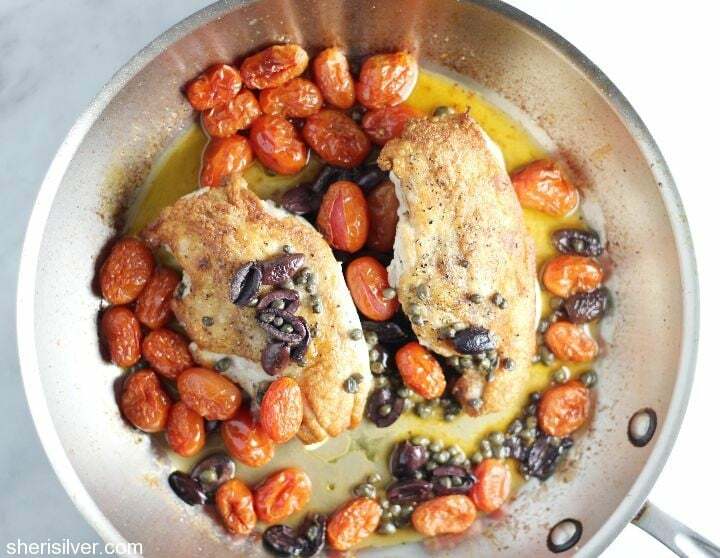 In a medium bowl combine the tomatoes, olives, capers and two tablespoons of the oil. Toss well and set aside. Heat a large, ovenproof skillet over high heat. Pat the chicken dry and season well with salt and pepper. Add the remaining tablespoon of oil and heat till hot but not smoking. Working in batches if needed, cook the chicken, skin side down, till skin is a deep golden brown (about four minutes). 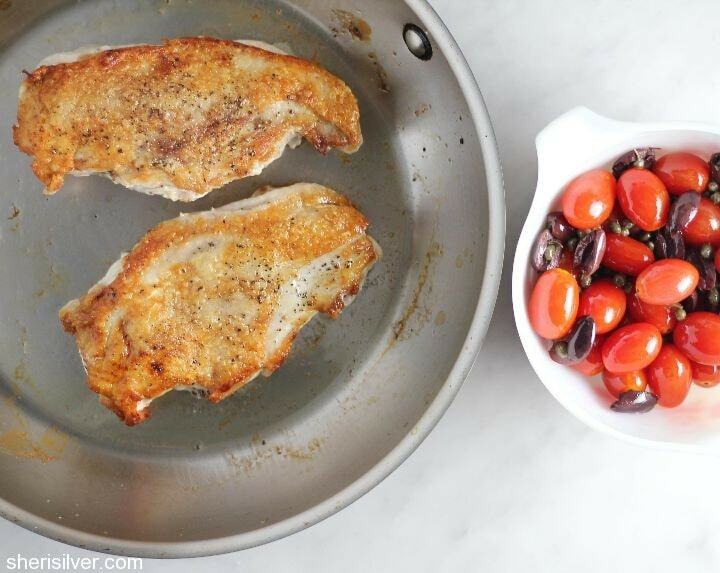 Turn the chicken over and pour the tomato mixture over. Place in the oven and cook, uncovered, for 18 minutes. While chicken is cooking, make the rice: Heat a medium saucepan over high heat till hot. Add the pasta pieces and stir till golden brown – transfer to a small dish and set aside. Melt the butter and cook the onion, along with a pinch of salt, for 2 minutes. Stir in the rice and cook, stirring, for one minute. Return the pasta to the pot along with the chicken broth and bring to a boil. Cover and simmer for 15 minutes. Remove from heat and let sit, covered, for 10 minutes. Uncover and fluff with a fork; serve with the chicken. 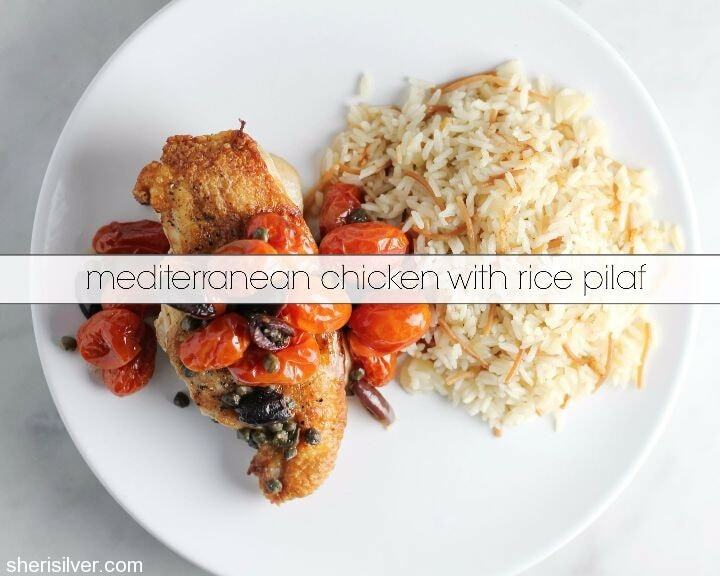 Check out all my “Dinner IRL” recipes on this Pinterest board! This looks delicious but I think I missed the reason why we turned the oven on to 475. Are we putting the chicken into the oven after adding the tomato mixture? Do we cover the pan in the oven? BTW–LOVE your blog. Marissa – first of all, THANK YOU! Second, I edited the post to clarify – yes, you put the chicken in the oven – uncovered – after topping with the tomato mixture! LOVE THIS!!!!!!!!!!!!!! The whole idea, the recipe, the way you’ve designed and written it….well done!